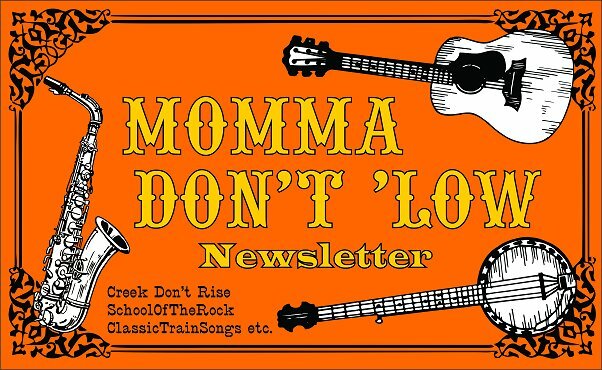 This is the unsubscribe page for Mama Don't 'Low™ a newsletter to support home-made and roots-based music, as well as the readers of our music articles on various web pages, including CreekDontRise.com, SchoolOfTheRock.com, and ClassicTrainSongs.com. If you wish to unsubscribe for any reason, simply fill out the e-mail address under which you are receiving the newsletters, and we will graciously unsubscribe you before the next update. If you would like to add your name or a comment of any kind, please feel free, but it's not necessary. If you ask a question, we will get back to you as soon as possible. Whatever else you get out of our pages, I hope you've enjoyed your visit. And please let us know if we can help in the future in any way. 2007, 2008, 2009, 2010, 2011, 2012, 2013, 2014, 2015 by Paul D. Race. All rights reserved.